I was thrilled to meet with Minister Diab, a Dalhousie MPA graduate. Minister Diab was a co-panelist at our closing IOG/FOM Inter-Jurisdictional Executive Leadership presentation evening Spring, 2018. She exemplifies the leadership necessary to thrive within a new and evolving inter-jurisdictional, inter-sectoral and interdependent world.” Dr. Martine Durier-Copp. 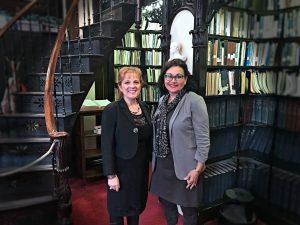 Dr. Martine Durier-Copp was honoured to be welcomed to the Nova Scotia Legislature by the Minister for Immigration and La Francophonie, Hon. Lena Metlege Diab, MPA. Martine began her career in international development in Montreal, relocating to Nova Scotia to take on challenging roles in the health care domain, serving as executive director of the Nova Scotia Royal Commission on Health Care and as the founding executive director of the Nova Scotia Provincial Health Council. Over the years, she has managed a number of international health projects and has, for over 20 years, served as a professor of the Dalhousie School of Public Administration.